Syrian photographer Mohamed Alrageb has won the $120,000 Grand Prize in this year's Hamdan bin Mohammed bin Rashid al Maktoum International Photography Award competition. 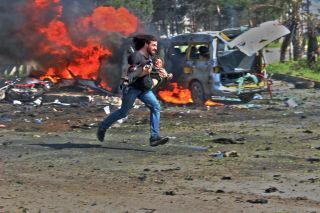 His winning shot shows a fellow photojournalist running with an injured child in the aftermath of a car bomb in Aleppo, with his camera still in hand. Now in its seventh year, the main theme for the competition was 'The Moment'. The award was collected from on behalf of Alrageb by Abd Halkadar Habak, the hero seen in the picture, from the Crown Prince of Dubai, Hamdan bin Mohammed bin Rashid Al Maktoum. Already the world's richest photo competition, next year's contest will have a total prize fund rising to $600,000 and will have the theme 'Hope'. Details will be available on the official website. In the Ross Sea in Antarctica, an adult emperor penguin is returning to the ice edge for the first time after being at sea for days or even weeks. Despite the long and arduous journey, the penguin will have a belly fully of ice fish and krill for its awaiting chick. The ancient and traditional practice of cattle branding is still being used to identify an animal’s owner in Argentina. Burning an identifying mark into the hide of an animal was, until the invention of the tattoo, the only method of marking that lasted the life of the animal. Argentinean cowboys (Gauchos) often use dogs to assist them in forcing the cattle to the area where the branding takes place.